As displays get bigger, the quality of the picture becomes more important. Big screen TVs are the main source of growth in an otherwise flat market. And with large TVs come higher resolutions. No matter how big the TV is, if it doesn’t have the necessary picture quality, users won’t be able to realize the power of the screen. That’s why large-sized TV has inevitably led to the increase in demand for Ultra High Definition (UHD). UHD is a 4K (3,840X2,160) picture quality, which is applied to TVs that measure over 65 inches. The technology is about to take yet another step up as 8K (7,680X4,320) TVs are ready to be commercialized. But this is an era where even the number of pixels isn’t enough in isolation. To produce the best picture quality possible, it’s also important to consider the environment this content will be viewed in and the quality of the original content itself. Worldwide UHD TV sales surpassed FHD (Full High Definition) TV for the first time last year, according to market researcher IHS Markit. It is expected that 100 million UHD units will be shipped this year, which is about 45% of the total TV market. In 2022, the proportion of UHD TV is expected to reach 60%. Samsung UHD TV sales volume is also on the rise. Sales of Samsung UHD TVs in the fourth quarter of last year already exceeded 50% of the total Samsung TV units sold globally. In the first quarter of this year, Samsung UHD TV sales also increased by more than 35% compared to the same period last year. In the ultra-high-definition TV market era, standards for judging picture quality are further developing. For example, is a TV able to reproduce colors with real-life brightness, particularly when the normal TV viewing environment is brighter than many would expect? According to the DOE survey, consumers in the U.S. and Europe usually watch TV in a bright environment with an average home illuminance level of 79 lux. Can a TV react and provide an accurate picture in these and other common viewing use cases? Experts advise consumers to look beyond the high resolution to see the different factors that cause the difference in brightness, contrast, and content when consumers watch TV. The way consumers view TV and the way experts gauge a TV’s ability to deliver is much more sophisticated than it ever has been. The TV needs to be more versatile because it’s used for more than just viewing a TV show. That means Samsung has to be stringent to make sure its QLED products perform not just according to the specifications but also according to real life usage. “A new criterion for picture quality is color volume, which can measure minute color changes, three-dimensionally, according to varying degrees of brightness,” adds Nxumalo. 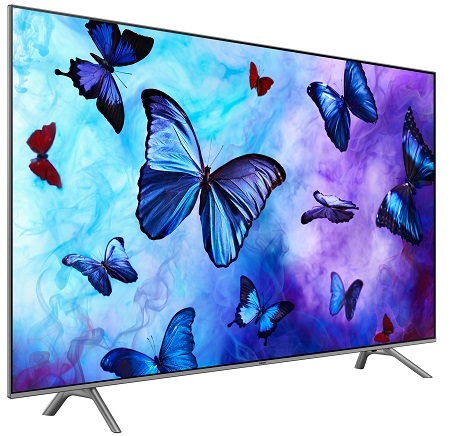 Verband Deutscher Electrotechnischer (VDE), a well-regarded certification institution in Germany established in 1893, certified QLED TV for 100% color volume for two consecutive years, which is the world’s first and only time a TV has received such a distinction. QLED TV, based on the metal quantum dot technology, can accurately represent detailed colors that can be hidden from dark or bright images. Brightness can be expressed up to 2,000 knits, which is 3 to 4 times that of conventional TVs, giving a more vivid look to scenes such as sunlight reflecting texture and white snowy landscapes. Indeed, this year’s Samsung QLED TVs achieved the highest level of contrast ratio by improving the quality of blacks on-screen while maintaining brightness. To create an even more stunning contrast ratio, the TVs feature new Direct Full Array technology, which puts backlit LEDs behind the panel for precise brightness control. By making the LED blocks more than ten times the number of conventional TVs, the light can be adjusted individually to create a subtler difference in black colors. Moreover, it applies the black algorithm that perceives and precisely adjusts black colors, successfully delivering the original detail even in particularly dark scenes. “When watching a dark scene in a bright environment, the reflection of objects around the screen can cause discomfort. QLED TV solved this problem by using Anti-reflection technology. Even under daylight or bright lighting, an anti-reflective screen dramatically reduces glare, allowing one to be more immersed in images regardless of the surroundings,” says Nxumalo. Along with this, Samsung is also working to expand the ecosystem to upgrade HDR (High Dynamic Range) technology, which is an integral function of ultra-definition TV. Since last year, Samsung has been developing HDR10+, which is one step more advanced than HDR10, a standard for realizing HDR video. HDR10+ is a technology that shows the optimal contrast ratio for each scene through ‘Dynamic Tone Mapping’ technique which applies different contrast to each scene. The company is expanding its HDR10+ content in cooperation with global companies such as Amazon, 20th Century Fox, Panasonic, and Warner Bros. High-quality content is as important as the ultra-high definition TV specification. Many of the most recognizable names in video content such as Netflix, YouTube, and various cable companies already provide UHD content. However, due to the burden of production cost, consumers are not able to enjoy 4K UHD broadcasting content on TV unrestrictedly yet. The problem here is that if the low-quality content is shown on a big screen, the pixels are usually enlarged artificially, causing the picture to shake or lose clarity. Samsung Electronics has solved this problem by installing the ‘4K Q Engine’ based on semiconductor technology on its QLED TV. ‘4K Q Engine’ is a technology that upgrades SD (400,000 pixels) and FHD (2 million pixels) class image to 4K (8 million pixels) class. Based on artificial intelligence, it applies a 5-step algorithm (Image Signal Analysis ▷ Noise Reduction ▷ Improved 1st Detail ▷ 4K Upscaling ▷ Improved 2nd Detail) to improve image quality and express hidden details. What’s more, 8K AI Technology will be introduced in the latter half of the year and will offer an even better picture and sound expression.